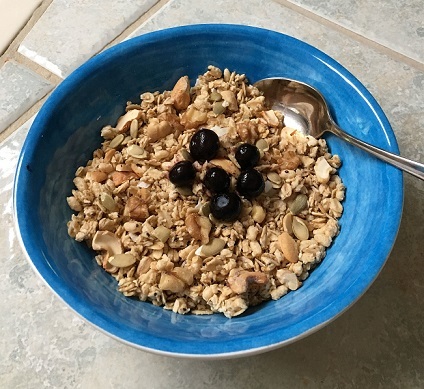 Here is a healthy granola recipe that you can make for yourself and your family. It is easy to make and smells wonderful while it is baking. Although there are many types of granola that are commercially available, the advantage of making your own, is that you will know that you are using only wholesome ingredients. It is important to remember is that a little granola goes a long way. It has high nutrient density, including calories, so while you are getting lots of great vitamins, minerals, good fats, protein and carbs, you are also getting calories. You can enjoy it as a snack or with milk for breakfast or as a topping for plain yogurt or fruit. If you use it as a breakfast cereal, add a few berries and some organic milk for an attractive and nutritious meal. Another great way to enjoy this recipe is to take it hiking or camping. It is easy to carry and will provide energy along the way. Keep in mind that you can use whatever nuts and seeds you have on hand, or eliminate the ones you don’t particularly like. For instance you can use macadamia nuts instead of almonds or an extra cup of pecans instead of cashews, etc. (1) Preheat oven to 250 degrees. (2) Combine oats, nuts, wheat germ and seeds in large bowl. (3) Put honey, oil, water, salt and vanilla in the blender, and process to emulsify oil and water. Pour over dry mixture and mix thoroughly. (4) Spread mixture on three large cookie sheets and bake at 250 degrees for one hour, stirring every 15 minutes. Be careful not to over bake. (5) Remove from oven and stir occasionally as it cools. (6) Store in cool, dry place or refrigerate for longer shelf life. *Good quality salt is less processed. I prefer to use Celtic Sea Salt, but there are other good salts on the market. **A good quality oil is one that is cold-processed and not treated with chemicals. I prefer olive oil, avocado oil or grape seed oil and would stay away from corn oil, soybean oil and lately there have been some questions about canola oil. Click here to go from Healthy Granola Recipe page to Pregnancy and Healthy Eating page.